since he can’t afford to hire help. During a citywide undercover operation conducted earlier this month, the State Liquor Authority and the N.Y.P.D. 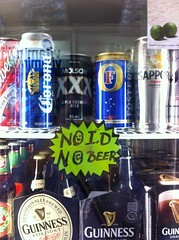 caught 118 convenience stores selling alcohol to minors. Among the East Village stores caught in the sweep was a convenience store on St. Marks Place that was already facing previous charges. Yesterday, the owner of that store said he was being unfairly targeted. According to the State Liquor Authority, the following stores sold alcohol to undercover volunteer decoys between Nov. 16 and 18: St. Marks Convenience Inc. (31 St. Marks Place), Ave A Deli & Grocery (123 Avenue A), Anwar Grocery (106 Avenue B), Yoo’s Convenience (50 Second Avenue), and C & B Grocery (248 East 14th Street). The businesses face fines of anywhere from $2,500 (the starting penalty for a first offense) to $10,000 per violation. 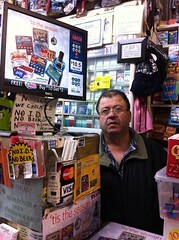 One of those stores, St. Marks Convenience, is no stranger to the S.L.A. According to documents obtained from the authority, the store is accused of selling to minors in May, June, July, and October of this year, and may face the cancellation or revocation of its license during a hearing set for Dec. 19. Hussein Elhage, who said that he has owned the store since 1990, admitted that he and his staff made the sales, but said that he was unfairly targeted during busy times, when he was too preoccupied to exercise his usual degree of diligence. 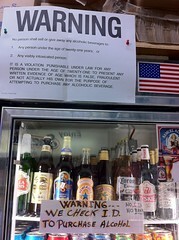 Daniel Maurer Signs posted on the beer coolers. Mr. Elhage, 56, said that he was the father of three teenagers as well as a nine-year-old, and that he discouraged underage drinkers. “When I see anybody who is underage [trying to buy alcohol] I say, ‘Go bring your father or go to the Ninth Precinct and get the police officer and let them buy it.’” As a result, said Mr. Elhage, minors have tried to outright steal from him. One such incident occurred on July 12, when according to a police report a teenage girl was arrested for stealing a can of Four Loko and a Starbucks coffee drink from the store. In March, Mr. Hussein filed another report complaining that another underage person had stolen a can of Four Loko and a can of beer. On a third occasion, he said, an older man (an undercover officer, he later came to believe) paid for a beer that a younger companion (the decoy, he believed) then grabbed and took out of the store before Mr. Elhage had a chance to ask for ID. Meanwhile, the State Liquor Authority shows no sign of relenting the ongoing operations that in August caught 123 convenience stores – including a dozen in the East Village – selling to minors.